If you’re like us, climbing tall buildings and hills around Edinburgh isn’t always at the top of your To Do list. Here’s an exciting opportunity to change that! 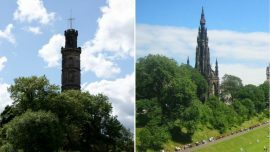 The Monumental Challenge is an invite to local Edinburghers between October 8 and December 8 2016 to climb all 430 steps to the top of the Scott Monument on Princes Street and Nelson Monument on Calton Hill. Register your success at the top of both by getting your ticket stamped and be automatically entered to win an exclusive package of experiences including…ta da…a £100 shopping spree at Cranachan & Crowdie. Here are the details for the Monumental Challenge.